Worse still, 52% of motorists confessed to not always wearing their vision correction while driving, with optometrist analysis showing that 7% - 2.8 million licence-holders - were putting lives at risk by getting behind the wheel because their vision unaided was either below the legal standard to drive, or borderline. Vision Express is introducing the 20m test into its flagship Oxford Street branch - and hopes to collate further evidence that passing the check is not a robust indicator of good visual acuity. o spearheading awareness-raising initiatives emphasising the importance of good driver eye health. • The legal minimum standard for driving in the UK is to read a standard number plate from a distance of 20 metres (or 20.5m for an old style number plate) wearing corrective lenses if required. Visual acuity must be at least Snellen 6/12 with both eyes open. Any driver unable to meet these standards must not drive and must notify the DVLA, which will refuse or revoke a licence. • The number plate test was originally introduced over 80 years ago in 1937 at a distance of 75ft (23m) before the Second World War. In 1971, to reflect a change in number plate size, the distance was amended to 67 feet (20.5m). The requirement to read a number plate at a distance of 20m came into force in 2003, the result of the font size on the new number plate. • The UK driver eye sight-testing regime is far behind many other countries in Europe. The UK was one of only five countries out of 29 in Europe assessed by the European Council of Optometry and Optics (ECOO) to use the number plate test for new drivers. The Council states that the 20m number plate test “is not a measure of visual acuity”. In 22 of the 29 countries assessed by the ECOO, a doctor or an ophthalmologist is required to undertake the eye testing. In the UK this is done by a driving instructor. • In 2017, a total of 6,954 drivers had their (Group 1) licences revoked for eyesight-related conditions. Over 40% of these were aged under 70. 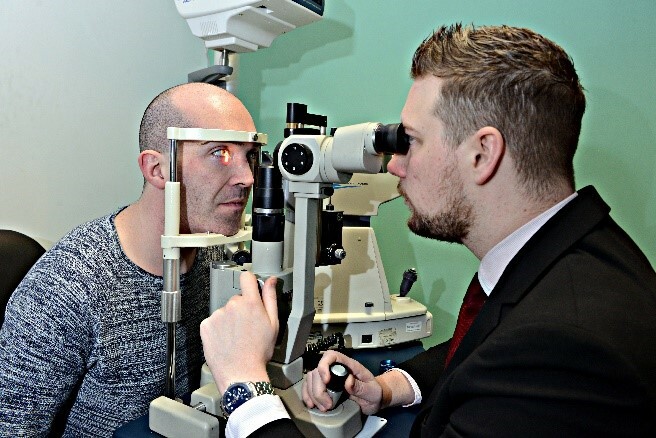 • The UK has a worsening outlook for eye health: over 2 million people are living with sight loss, 50% of which is preventable, and forecasters predict a further half a million could lose their sight by 2020. For 53% of these, a simple sight test and new glasses could make a huge difference. • Deterioration of eyesight is often gradual, yet regular sight checks can pick up subtle changes in visual fields. Early treatment is essential to safeguard vision for life. • The College of Optometrists surveyed 3,000 drivers and found that one in five admitted driving knowing their vision was poor. This is echoed by a Brake survey in which 19% of drivers put off visiting an optician when noticing vision problems. With almost 600 stores nationwide, Vision Express first opened its doors in Newcastle in 1988. Built on a passion for the profession, it has gone from strength to strength, driven by a commitment to unparalleled customer service and providing the best individual optical care, the right product and great value. Customers can select from a vast range of genuine designer brands and the latest technology lenses, through to complete glasses from 39GBP. This press release was distributed by ResponseSource Press Release Wire on behalf of The Tonic Communications in the following categories: Health, Motoring, Retail & Fashion, for more information visit https://pressreleasewire.responsesource.com/about.